Another day, another sale. 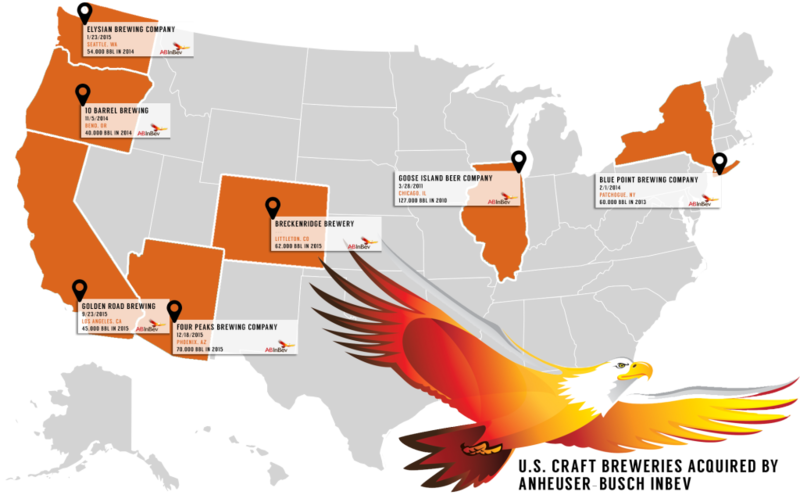 In the last week, we’ve seen two more AB-InBev (ABI) acquisitions in the US. First, Four Peaks out of Tempe, AZ and yesterday, Breckenridge from Littleton, CO. While the names on the seller side may sometimes come as a surprise, the fact that transactions are happening should come as a shock to no one. ABI’s volume declines are well documented, as is their scorched earth acquisition strategy covering the entire spectrum of the beer (and cider) biz. From SABMiller to the neighborhood brewery and pub, ABI’s goal is to be everything to everyone. They know you are going to drink beer (and by you, I literally mean almost everyone on planet earth), and they want to do everything they can to make sure it’s their beer you’re buying. This is a cut-throat, aggressive business dominance game that is typically relegated to B-school simulations being played out in real life. And if you ask me, the deals aren’t close to coming to an end. Here is a map of ABI’s acquisitions since the Goose Deal, which looking back was acquired at a great value ($38.8 Million for 127,000 barrels of production – even at the bottom end of today’s valuation ranges, an independent Goose would likely fetch upwards of $150 million today). First: why you should expect to see the deals continue. I am of the personal opinion that the era of taking your brewery national is gone. If you aren’t national, or at least in a significant multi-state region, now… you never will be without the help of a “Big Brother” (hey, like ABI!). I strongly believe the horizon for craft brewers today is in their home region and strategic planning for a big, broad national strategy (again, unless you are already going in that direction) is foolish and/or dishonest. Sure, craft beer lovers will tell you how much they would love to see Brewery X come to their state, but their buying habits don’t really support territorial expansion. To illustrate this, I present some anecdotal IRI data. IRI tracks scan data for consumer goods and calculates market share for companies in various segments. When you hear that craft beer has an X% market share in the off-premise channel in Portland, OR… that’s IRI data telling you that. To illustrate my point about the localization of the marketplace for craft beer, I’m going to use one of the indisputable best breweries in America, Firestone Walker. I say indisputable, because it really is. They win Best Brewery year-in-and-year-out in competitions and most people know how amazing the beers they make are. On the flip side, I concede that my brewery, Freetail, is not one of the indisputable best breweries in America. We don’t win Best Brewery year-in-and-year-out expect for in our hometown. That’s okay though. Firestone Walker distributes in San Antonio, using the same distributor as Freetail. Yet, Firestone Walker’s market share is 1/13th the size of Freetail’s in the San Antonio market, and Firestone is only the 37th Ranked brewery in the IRI Craft category in our market.This isn’t a sign that San Antonio hates good beer either… Austin and Houston markets are pretty much the same story for Firestone. People simply don’t buy a lot of Firestone Walker down here, and it’s not because it’s not a great beer (It is! Seriously… buy more of it!) – it is because beer drinker preferences are decidedly geared towards local. In fact, the only non-TX brewers that have a higher market share than Freetail in our home market are Boston Beer, New Belgium and Sierra Nevada, which are not coincidentally the 3 largest craft brewers that distribute to our market. No other national/semi-national brand approaches even 1/2 of Freetail’s market share – not Stone, Deschutes, Lagunitas, Odell, Dogfish, etc. Again… local dominates. It’s not a long list… we could probably expanded it out to 25-100k bbls, but you can do that research on your own. But my personal prediction is that we’ll start hearing of more dominoes falling soon, and it shouldn’t shock you. Lastly, none of this should make you mad either. I hate seeing other brewers taking shots at those who have sold simply because they have sold (granted, I have taken shots at some myself… but it’s not because they sold, but because they had previously taken shots at others themselves, or because they keep trying to spin these acquisitions as some great partnership that is good for craft beer… just tell it like it is, a deal that is in the best interest for the company’s shareholders and it would be a violation of their fiduciary responsibility to not take these deals). My ultimate exit strategy for this business is me dying… and I don’t have ambitions to sell… but if I were given the opportunity to set my family up for life and to return amazing value to my small handful of original investors (seriously, we only have two who aren’t part of my nuclear family)… I would have to consider it. It’s time to stop calling them sell-outs or traitors. They are people, people who did what was best for them. With that said, I by no means am suggestion that ownership shouldn’t matter to you. It should, but you can separate the beer from the people behind it. You can decry the new owners, but don’t vilify the old ones. On a side note… it hasn’t been major news because we’re a small company, but I am actually in the process of doing the opposite of selling-out. I’m selling-in: bringing in new investors and new capital to help our company grow to maintain our independence. There are nothing but great things to come for us, and this is the only job I’m probably any good at anymore… so I’m double, triple, quadrupling down on our company and direction. This is what’s right for Freetail, but it may not be right for everyone, and that’s okay.